NPS® now offers the complete Science Lab package. 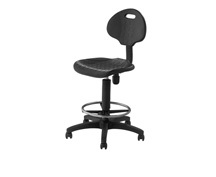 A staple in school labs nationwide, we offer the perfect stool for every need. Choose from our bestselling #6200 Series, built with a masonite hardboard seat, or the #6400 Series padded seat. Optional chrome-plated adjustable height legs and/or adjustable backrest provide a myriad of options for your venue. #6200 Series Stools are available in grey powder-coated frames, and the 18”H & 24”H, standard or adjustable height models are also available in black. New for 2016 is the #6700 Series Kangaroo Stool. 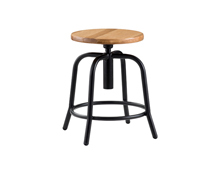 Made of black polyurethane on 5 legs, the Kangaroo Stool is perfect for all your industrial seating demands. 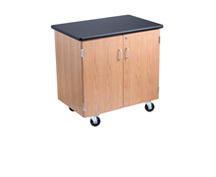 Matched to our high quality Science Tables in twenty four sizes & options, we now offer a complete science lab package. 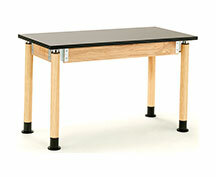 Tables offer a choice of book compartment or standard apron, with an industry top-of-the-line ashwood frame and legs. Available in Chem-res tops for middle school ages and in a Phenolic Resin top for higher grades as well. Available in 36" height as well. New for 2015 patented Adjustable Height Leg Science Tables, in your 22 choice of black or matching woodgrain legs.